Finding the perfect model for the given dataset is often difficult. Perfectly tuned model requires tuning many parameters which cannot be learned from data also known as hyperparameters. These hyperparameters are generally dependent on each other and the only way to evaluate their combinations is by training a model and testing it, which is expensive process. 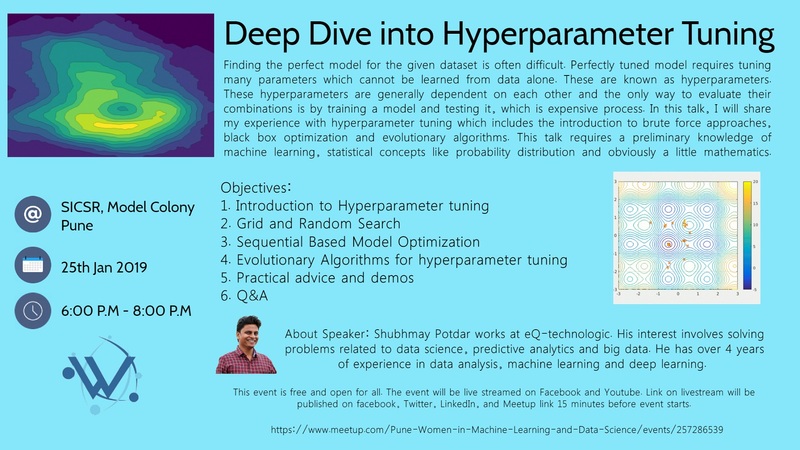 In this talk I will share my experience with hyperparameter tuning with includes the introduction to brute force approaches, black box optimization and evolutionary algorithms. This talk requires a preliminary knowledge of machine learning, statistical concepts like probability distribution and obviously a little mathematics. About Speaker: Shubhmay Potdar works at eQ-Technologic. His interest involves solving problems related to data science, predictive analytics and big data. He has over 4 years of experience in data analysis, machine learning and deep learning. Time : 6 p.m. – 7:30 p.m.